The designs of the medal set concentrate on three distinct chapters in the life of Václav Havel: playwright, dissident, and president. All three reverses are designed by Czech Mint medalist Vojtěch Dostál, who also provided the three obverse portraits, each of them slightly different. Playwright — The reverse design includes the word DRAMATIK and, arranged within an off-center circle, a montage of words from the titles of Havel’s works. In the obverse portrait, Havel wears a pair of reading glasses, emphasizing the playwright’s philosophical detachment. Dissident — The reverse design depicts the word DISIDENT and a hand holding up two fingers in a 1960s-era peace sign. On the obverse, a more unruly hairstyle hints at the dissident’s reluctance to submit to the totalitarian regime. 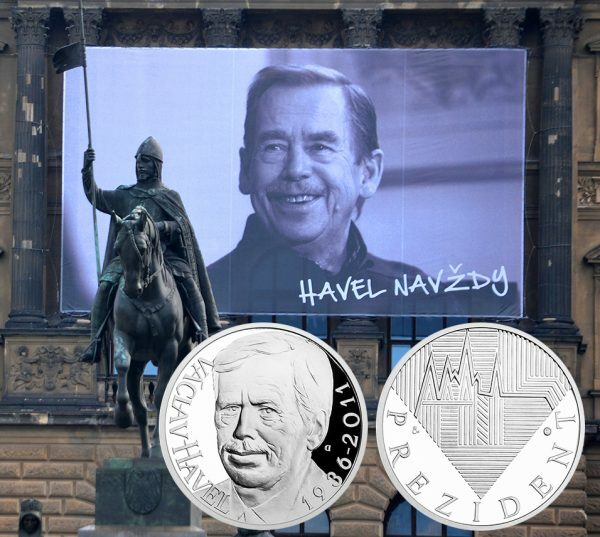 President — The reverse features a linear skyline of downtown Prague, the word PREZIDENT, and a stylized depiction of St. Wenceslas Square (the scene of the initial protests in 1989 that shunted Havel to the presidency by the will of the people). Although the president on the obverse is outwardly restricted by a necktie and a formal suit, his lively gaze suggests that he has not changed inwardly. The medal sets were launched on what would have been the 80th anniversary of Havel’s birth (October 5, 1936) and will be available in two versions: .999 fine gold and .999 fine silver. Proceeds from the sale of these medals will go as usual to the projects of the Dagmar and Václav Havel Foundation VIZE 97, with which the Czech Mint has been associated for many years. For more information on these and other medals and coins offered by the Czech Mint, please visit their website. International orders dispatched where applicable. Born in the Czech capital city of Prague . . .
…into a family with strong links to the arts, commerce, intellectualism, and politics, Havel was just two years old when the Czechoslovakian Republic was divided up and a region of the country known as the Sudetenland, which was populated by a German-speaking minority, was “reunited” with—or annexed by—Hitler’s Third Reich in exchange for “peace within our time.” The ensuing events in 1939 resulted in the complete division of Czechoslovakia and an occupation of both entities until the end of the Second World War. When the two Republics were liberated by Stalin’s forces of the Soviet Union, it soon became clear that, once reunited, the country would be unable to return to its Western-leaning influences and alliances but would be included in the Soviet sphere of influence—what Winston Churchill would later call the “Iron Curtain.” The installation of the communist-led government in 1948 solidified Czechoslovakia’s position within the Communist Bloc of nations, with a command economy and a one-party state. It was during these years that Havel grew up and received his education. He had initially opted for a curriculum in humanities but, for political reasons and because of his familial connections to former politicians, he was prevented from doing so. Havel later chose the subject of economics and completed his secondary education in 1954. It wasn’t until after his completion of national service in 1959 that Havel’s attentions turned back to the humanities and Czech culture, when he applied for and was accepted as a stagehand at the Divadlo ABC theater in Prague. Havel showed real interest in dramatic arts, and he wrote and saw his first play, The Garden Party, performed in 1963. This work was soon followed by a more successful endeavor entitled The Memorandum—later to be considered one of his greatest plays. Events in 1968, however, would thrust not only Havel but also the whole of the country into danger as a time the world would remember as the “Prague Spring” unfolded. In January of that year, an enlightened and reform-minded politician named Alexander Dubček (1921–1992) had been elected as First Secretary of the Czechoslovakian Communist Party—effectively the country’s head of government. Within just six months of Dubček’s election (and what many Czechoslovaks had thought would be the beginning of the end of the restrictive and rigid Communist system of government), Warsaw Pact nations headed by Soviet armed forces had invaded the country and their tanks were patrolling the streets of the capital. Alexander Dubček and other senior members of the Czechoslovak government, including its president and prime minister, had been taken to Moscow and compelled to sign the Moscow Protocol, which ensured they would preserve the Communist and socialist government. Over the coming months, the ideals of the Prague Spring were subdued by both the presence of the militaries of the Warsaw Pact nations and the turnaround of those who had earlier envisioned a more Western-leaning government. Dubček eventually lost both his chairmanship and his seat in parliament and was actually expelled from the Communist Party in 1970. It was at this time that Havel turned his attentions to the suppression of the hoped-for reforms of the Prague Spring. As his efforts intensified, he gained the attention of the authorities, who promptly banned him from further activity in the arts and from any international travel. Havel continued to write, however, and even intensified both the volume of his work and the breadth of its distribution via an underground network. His reputation for dissention greatly increased but also drew greater attention from the authorities, eventually resulting in many instances when he was imprisoned. From May 1979 until February 1983, Havel was imprisoned but continued to write, including letters to his wife, Olga Havlová, whom he had married in 1964.